Want to show off your rummy skills in WRT 2015? Join Junglee Rummy’s special promotions that will make you earn your tickets to the grand event. The special promotions in Junglee Rummy are made in such a way that, the winner will get World Rummy Tournament 2015 Stage II Qualifier tickets if he plays and wins maximum cash games in the promotion period. 41 tickets are up for grabs. Book your seats to the qualifier rounds by winning your ticket. 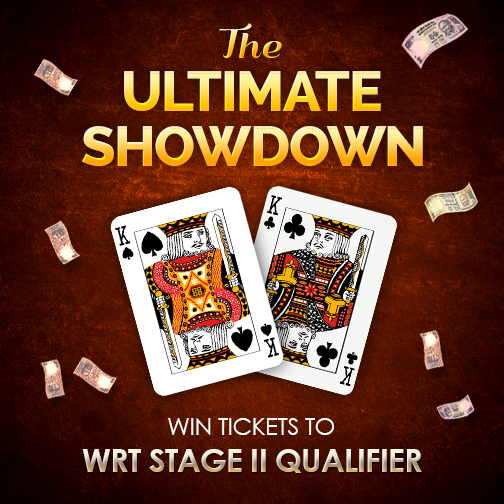 The Junglee Rummy promotion named The Ultimate Showdown is your chance to grab the tickets to WRT 2015 Stage II Qualifiers. In order to win the tickets, you need to play and win maximum games between dates 8th Jan 2015 00:01 hours and 9th Jan 2015 23:59 hours. Winning the tickets will take you to a cruise trip to Singapore, Penang and Kuala Lumpur for the grand finale. To know more about Junglee Rummy or WRT 2015, please visit our Online Rummy Reviews page. Also, post your valuable feedback and suggestions in the comment section below!